Evangelical Chaplains Test Bounds of Faith in Military The percentage of Evangelical Christian chaplains in the military is higher than their faith's representation in the ranks. The military directs them not to proselytize, but many say that would force them to deny a basic tenet of their faith. The idea of a chaplain along the lines of the ecumenical Father Mulcahy of television's M*A*S*H is fading away in the military. The percentage of Evangelical Christian chaplains is higher than their faith's representation in the ranks. The military directs them not to proselytize. But many say that would force them to deny a basic tenet of their faith. Walk into just about any Christian bookstore and you are likely to find a copy of The Soldier's Bible. The leather cover comes in a choice of green for the Army, black for the Navy, burgundy for the Marines, blue for the Air Force and -- just released -- blue for the Coast Guard. These are handsome Bibles with gilt edges, just the right size for a service member to stuff into his or her pack. Printed on the front is the emblem for the appropriate branch of the armed services. And that's a problem. One could be excused for thinking that this Bible was put out by the military. But it's not. 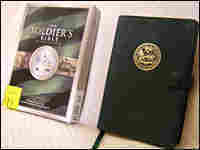 Holman Bible Publishers of Nashville developed, printed and distributes The Soldier's Bible at its own expense. Still, critics think the emblem on the front brings up legal questions -- and may even violate the Constitution's ban on government-established religion. What's especially troubling to some is that this particular Bible is clearly evangelical. Holman Bible Publishers is owned by the Southern Baptist Convention. On the first few pages, there's a "Plan for Salvation" that says you must be baptized as an adult believer to have eternal life. Printed in the back are inspirational words from military leaders such as Lt. Gen. William Boykin. He raised a few eyebrows back in 2003, when he said of his battle against a Muslim warlord in Somalia, "I knew my God was bigger than his. I knew that my God was a real God and his was an idol." Evangelicals are playing an increasing role in the military. Department of Defense statistics show that 40 percent of active duty personnel are evangelical Christians. Sixty percent of taxpayer-funded military chaplains are evangelical. "It does raise the question of whether we are, effectively, as a country -- with tax dollars -- promoting a particular evangelical religious viewpoint," said Barry Lynn of Americans United for Separation of Church and State. Add to that a privately funded evangelical Bible that looks official, and critics say the military has a problem that needs to be addressed. The Army says the use of its emblem "is authorized in publications and other printed matter of an official or quasi-official nature." The Army's Institute of Heraldry is the keeper of the emblem. If you want to put it on a T-shirt or bumper sticker, you first have to get permission from Stanley Haas at the Institute. Haas says to his knowledge, Holman was never granted permission to put the Army's emblem on The Soldier's Bible. But he also doesn't keep a list or database of people who've been given permission. Haas says people simply write in to request permission and he writes back, telling them yes or no. He says that normally, permission would not be granted for anything religious. But Ricky King, product development manager with Holman, says the company has written permission on file from each branch of the service. When asked how the Army enforces its rules on use of the emblem, Haas said he doesn't have the staff to go around the country looking for violators. So, he said, the rules are "almost unenforceable." Army Chief of Chaplains David Hicks says he's perplexed how anyone would conclude this is the Army's official Bible. The front of the book states that Holman is the publisher. Still, Barry Lynn of Americans United for Separation of Church and State says the military should enforce its own rules and require Holman to remove the emblem from its Bibles. "If they haven't even sent a letter suggesting that these be removed, then one thinks that perhaps the military is just winking at this and is not planning to do anything about it," Lynn said. Chaplain Hicks says it would be a shame if military emblems have to be removed from The Soldier's Bible: "It just brings us together as a group of people and gives us an opportunity to identify with our Army as a band of soldiers and believers."